Turning this mode on adds a few extra details to the game's graphics. Most notably are shadows on some small objects. Turning this option on may cause the game to run less smoothly if you have an older computer. This changes the sensitivity of the mouse. If you want the mouse to react more quickly to your mouse movement, slide it to the right. To give you more precise controls, slide it to the left. 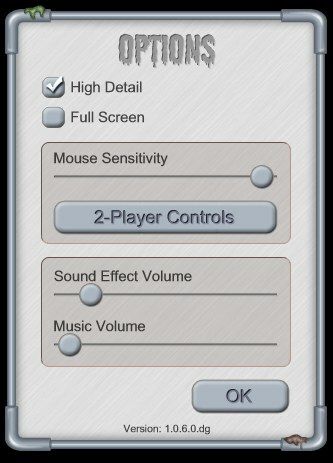 This lets you choose which controls each player will use. Choose between mouse, WASD keys, or the arrow keys.